Orvieto is a gem of a town in Italy. Perched high atop an Umbrian hill, it has beautiful spaces, dramatic views, famous art and dramatic history for visitors to enjoy. The old part of the city is a bit of window into the past because it is virtually traffic-free. 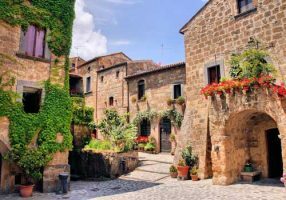 Only an hour-and-a-half north of Rome, the walled city of Orvieto is a great place to experience an ancient, important hilltown. It is convenient too, since it is fairly easy to reach from Rome or Florence. Easy daytrip from Rome. You can even take the train. Or, for a relaxing outing we can recommend a private driver who will organize a day excursion so you can relax and take in the scenic views along the road. Convenient drop-off point for a rental car when traveling to or from Rome, avoiding all traffic around the city…and you can visit the charming town and then hop on the train to Rome. Stopping point for trips between southern points and northern ones. Nice to get off the highway and have a delicious lunch in the piazza. Recommendations on what to see and do. Wander the town to discover on your own, or you could sign up for a walking tour to guide you and provide the fascinating history of the town. 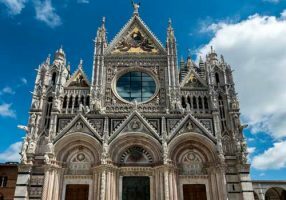 The Cathedral/Duomo is beautiful, colorful and famous for the splendid mosaics of the facade. Inside are famous frescoes, notably the Judgement of Luca Signorelli, one of the masters of the Renaissance telling timeless stories. Also find fine sculptures. The cathedral piazza is a nice place to enjoy a coffee or a Spritz. Wander the city to find a magnificent XIII palace and the medieval tower that you can climb for a breathtaking view. Then head for the medieval district on the western part of the city where you can get lost on the steep and narrow streets with ancient houses and surprising panoramic views. One of the cities of the Etruscan League before the rise of Rome, you can find an archaeological museum in the Cathedral/Duomo piazza. 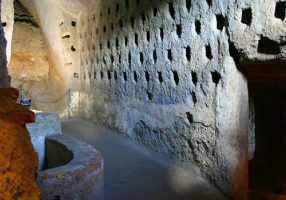 And then, visit, just outside the town, a fascinating Etruscan Necropolis (city of the dead) . Ancient caverns wind through the rocky prominence with tunnels and rooms that were excavated by the Etruscans and used in the misty past. A 45 minute tour of Orvieto Underground leaves from the tourist office near the Cathedral/Duomo. Saint Patrick’s Well (Pozzo di San Patrizio) was the solution to water during medieval sieges. It was dug through the stone 175 feet with TWO spiral staircases for people to haul up their water. Guests are welcome. Park at the bottom of the cliff near the train station and take the funicular up. This is also your starting point if you take the train. Park at Campo Boario an underground parking about halfway up. Elevators/escalators to the center. Drive up to Piazza Cahen where there is limited parking. The local tourist office website is helpful.